Back on the 1st November 2012 new EU Tyre Labelling regulations came into force and as of the 1st of July 2012 all tyres manufactured must carry a ‘tyre label’. The labels are designed to help you make an informed choice by comparing the different characteristics across all the tyre brands and patterns available. In the same way you might when considering purchasing items like white goods. With ‘A’ being the most efficient and ‘G’ being the least. A rolling tyre deforms and dissipates energy. The energy that is lost is known as rolling resistance and directly impacts on fuel consumption and the environment. 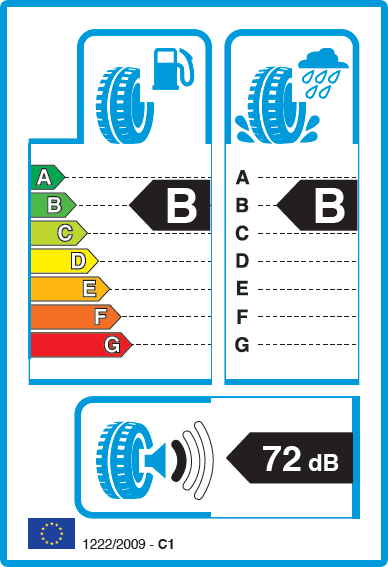 A tyre’s exterior noise grading is expressed in decibels (dB) and accompanied by one, two, or three sound waves on the label to indicate the noise level. One wave is the best for performance and three is the worst.